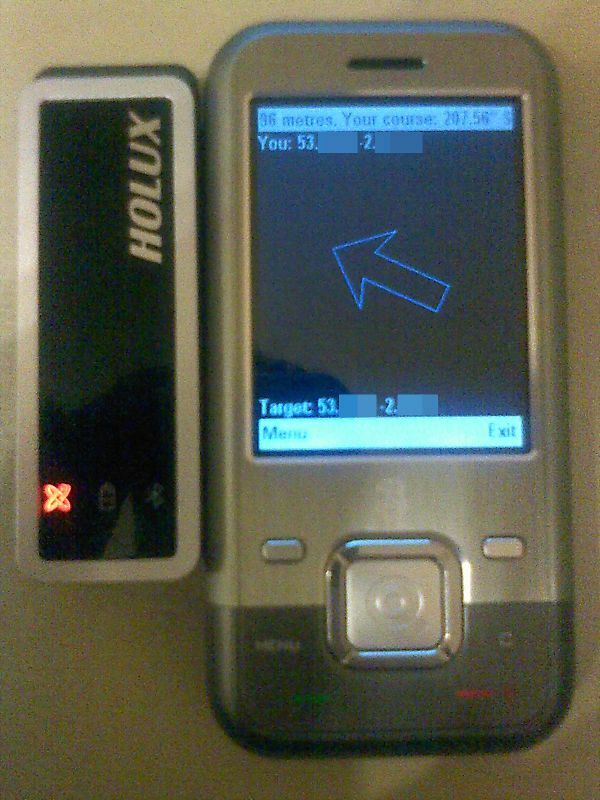 FollowMe is the new name for Silent Software's LocateMe, this small (45K) application requires a mobile phone with an integrated GPS or a separate Bluetooth GPS and will show you the direction to given locations ("targets") without maps, using a pulsing direction arrow. You can request the location of other FollowMe users by text message, send your own position, or just simply save locations ("targets") for directions back to them later. Targets can even later be imported into Google Earth or Maps. Complete integrated GPS support (some features may not be available depending on phone GPS capability). The application is not security signed (this costs money! ), so you will be shown numerous security popups when you start it. As your phone is not a compass the direction target arrow will only point to the correct direction once you start walking, and the phone can determine which way relative to North you are going, i.e. when you are stood still your phone doesn't know which direction you are facing! :) On startup, until the GPS gets an accurate fix, the direction arrow to the target WILL NOT BE SHOWN. On first run there can be some delay discovering the Bluetooth devices in busy areas (i.e. it may display "Waiting for GPS..." on first run for some time). This is down to the Bluetooth device discovery picking up a large number of devices and querying them. Once you have located your GPS, future connections to the GPS do not require this discovery period and will be relatively quick. This software has been tested on Nokia Series 40 3rd edition phones at a minimum resolution of 128x128 pixels and Sun WTK emulator at 240x320. It has also been successfully tested on a Nokia N95 and Nokia 6650 with integrated GPS', and the INQ1 phone with separate Bluetooth GPS. but if i try in Eclipse Pulsar why a lot of errors??? can you explain to me??? Sorry I've not loaded this in Eclipse Pulsar - I've only ever used it with an old version of Eclipse (Europa I think) with the J2ME WTK plugin. Do students on your course use this as a standard example (i.e. part of the syllabus, recommended by your teacher)? If this is true, I might be willing to spend more time on it (FollowMe is quite old now). P.S. I suspect the errors may be because of the version of compiler in use (it is not JavaME)? if FollowMe old, what's new??? can this application send automatically sms based on the time we want??? In one link, you packaged the lapi.jar, and the other don't. Does the link with lapi.jar fully work on devices without the jsr-179? I mean, if I install on a non enabled gps device, WITHOUT the jsr 179, will it work? will it be able to provide it's own location via cell ID for example, without the use of an external bluetooth gps? Felipe you are correct. The integrated GPS download is intended for phones already with JSR-179 (since they have a GPS they will also have this JSR). The version for use with a separate Bluetooth GPS is bundled with lapi.jar because any phone that does not have a GPS will also not have JSR-179. Have a look at http://mirror.viperfang.net/silentdevelopments/javadoc/followme/uk/co/silentsoftware/reader/package-summary.html for how it switches between 2 implementations of a GPSReader, one that uses the Bluetooth API, the other the phone's built-in JSR-179 LocationListener. Currently the above are the only 2 implementations but adding your own is very simple - you just implement the 2 methods in GPSReader interface and read the coordinates from another CellID API and "push" the coordinate's raw NMEA data or Location object to the method FollowMe.pushDataToView(...) which would process/display it. Felipe: Obfuscate the compiled code. JavaME can't tell then is the namespace conflicts allowing you to install it. sorry for all this questions, but it has been really interesting... So, you just compile the lapi classes with the rest of the j2me code, and then obfuscate the compiled code? First I want to thank you for sharing this. I'm new to all this thing, so I have some basic questions that I need answers for desperately. Your FollowMe.jar is only 39kb in size, but when i downloaded the source code and built it without making changes the file became 67kb in size. Further more, when I deploy the 67kb file to my nokia e71 it tells me that it's not compatible with the phone were as your original 39kb file installed fine. The file runs fine in the emulator, but doesn't install when i move to the phone.. Sounds like you built it with lapi. See above comments. Hi again, thanks for replying. TBH I didn't really understand the comments above. When you say "built with lapi", do you mean that it was included in the source already? I didn't include the jar file when I was deploying. Both of the download binaries are obfuscated. The version without lapi does not need to be obfuscated (I just built it that way*). Obfuscation prevents the lapi.jar from being recognised as part of the core Java libraries (which ordinarily would not be allowed to install on the phone). *Ofbuscation will also make the file smaller - 67K is the correct size if you do not obfuscate the non-lapi version. You can obfuscate the code using Pulsar's "Create Obfuscated Package" option. Note that FollowME is now quite old and on modern touch screen phones it adds extra touch controls and "A B C D" options which doesn't look very good (there is probably a way to disable this). On my Nokia 5230 it also does not show anything in the Satellites or Data View if using the integrated GPS. There is probably a way to fix this - I think I may have missed something in the location api (i.e find out why it isn't reading satellite ephermeris). Using a Bluetooth GPS will still show Satellites and raw data information due to actually needing to deal with raw NMEA Strings and not Location objects (lapi). If you find out anything interesting please let me know! I've got problem with launching your application( No Class Def Found Error javax/microedition/location/LocationListener) I'm trying to include lapi.jar to build path and also obfuscate binaries code but it doesn't helps. "No Class Def Found Error a/bb/cc/ddd".